Last practice before the summer nationals! The clinic is intended for all advanced levels: youth, juniors and adults, to get ready for the most important event of the year: Summer Nationals and July Challenge! Get three days of intensive training with Coaches Daniel Hondor, Julian Rueda Espinosa and Olympia’s elite fencers. Olympia Fencing Center is New England’s premier fencing club, recipient of the numerous awards and titles. 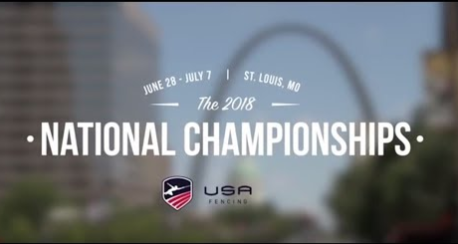 Our students are multiple national and international medalists, five times in a row Pomme De Terre champions, double medalists at the 2017 and 2018 Junior Olympics, in Cadets and Juniors Men’s and Women’s Epee. Six of the US National team members are Olympia’s students – come and train with the best! Campers will be assigned to groups by fencing level. Common warming up, stretching and conditioning, specifically designed to improve or highlight fencer’s athleticism, speed and endurance. Youth fencers will have opportunity to learn from more experienced fencers. Individual lessons are available after/before and/or during the camp hours, upon request. Pay $100.00 deposit via askfred, complete your payment in your first day, by credit, check or cash. Registration is now open on askfred. Pre Registration closes on 06/14/2018. $100.00 late fee applies after. This entry was posted in Camps at Olympia and tagged fencing summer nationals, July Challenge 2018, Pre-national epee clinic, summer nationals 2018. Bookmark the permalink.